Join the discussion on our forums! Come discuss Infested Wolf over in our dedicated Infested Wolf discussion topic. Deathrattle: Summon two 1/1 Spiders. A little flea powder will fix that right up. t3 Fiery Bat from Desert Camel; t3 Desert Camel or Carrion Grub into t4Houndmaster; t4Infested Wolf (or a Beast buffed by Houndmaster) into t5 Ram Wrangler; t6 Savannah Highmane. Throw in Tomb Spider to find a "what do I need" card and that's quite a midrange curve. I find t2 the weakest spot as Huge Toad as a Neutral isn't great IMO and King's Elekk hates me (it pulled out Fiery Bat 4 times in a row in my first 4 games). 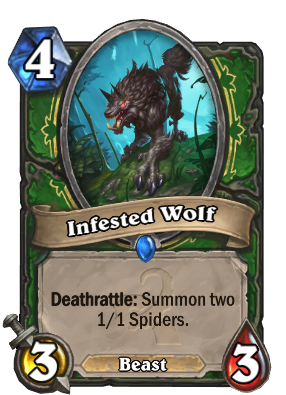 If this wolf were truly Infested, it would have Deathrattle: Add a random Beast to your hand. I don't think this card is amazing but it is a really good substitute for shredder (1 less attack and pretty similiar deathrattle) with the added bonus of being a beast. Maybe being a beast makes it better than shredder? It doesn't look like much but will definitely see a bunch of play. Its actually a substitute for Haunted Crepper. 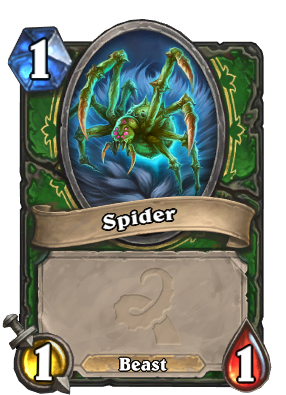 And the Spiders count as Beasts now which will make it even more effective for Hunter to use. yeah it spawns 2 spiders, but the spiders are beasts, and this card costs 2x as much mana. I would not call this a subsitute for haunted creeper at all. If you do want a substitute just use snake trap. this seems super mediocre? you'll have to be really wanting the beast or deathrattle synergy i think before your running this in constructed. One more stat (4/3 or 3/4) makes into better piloted shredder, so maybe the golden zone would have been a 3/4 that summoned a 2/1. As is, it's maybe playable, but i don't think super exciting. Yeah thats what Ben said, these are not undead spiders. Which I didnt know was a thing. Also thats creepy man. I would hate to see it gold and the legs be moving. On haunted creeper it says spectral spides, and ghosts don't have a tribe attached, so its actually pretty obvious if you think about it. 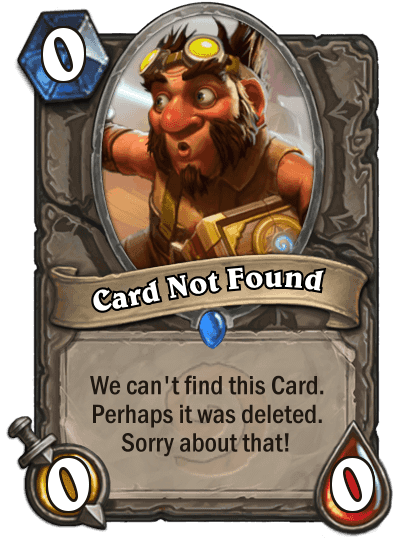 With the new deathrattle synergies I assume this card will be played a lot. Also the spiders it summons are actually 'beasts' so Houndmaster suddenly has more targets so 2X Houndmaster is definitely going to be a thing. I've been trying Beast Hunter and this card is insane! It secures almost 100% of the times you'll have a BEAST for a turn 5 Ram Wrangler. Check my deck out that uses them. Many saying the spiders are beasts. Can we see confirmation? Quit hyping me up. It's confirmed they are beasts. You can see a picture of them on the facebook page.